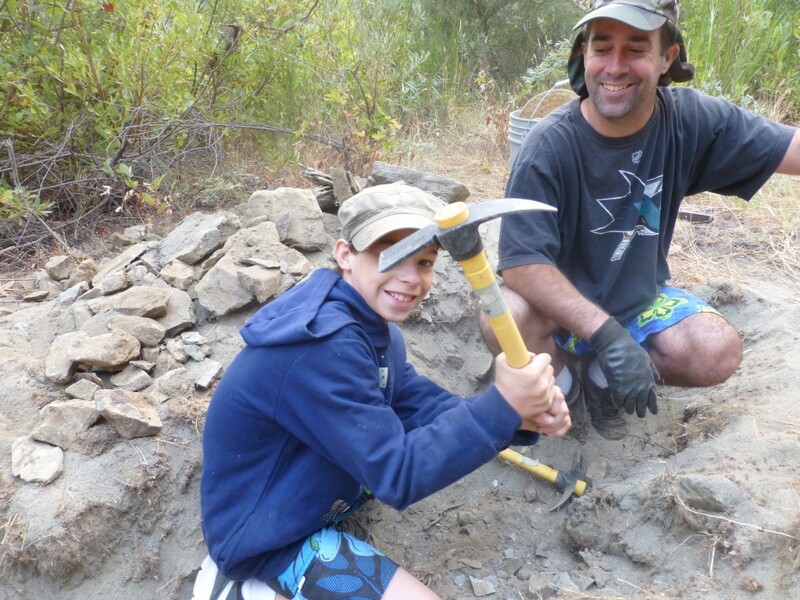 We sponsor weekend Group Mining Projects every third weekend during the summer season. These events nearly always take place along the Klamath River in the proximity of Happy Camp in northern California. The service is free to all of our active members. We encourage people to attend. 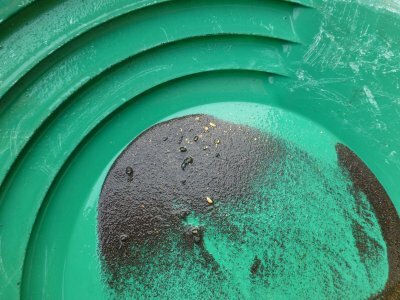 This is because there is a lot to be gained by participating in prospecting activity with others who are on the cutting edge of more effective ways to recover gold. Everybody who attends is entitled to an equal split of the gold that we recover on these projects. The events are a lot of fun. In fact, they are one of the primary benefits of membership in The New 49’ers that sets us apart from other mining associations. These weekend projects are one of our most successful activities. 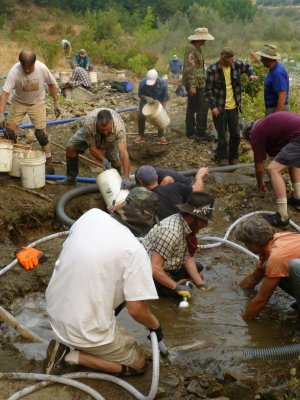 This is largely because so many people get introduced to the activity of successful gold prospecting and become passionate about it. Fortunately, we have a number of experienced members who volunteer their time to help organize these projects. Otherwise, there is no way we could manage the number of people who come. Our largest event drew in 137 people. That was so many that I had to use a megaphone to talk loud enough out in the field that everyone could hear me. That was too many people. I don’t ever want to do that again! It is more normal for the projects to involve around 40 to 50 people. That’s just about right. 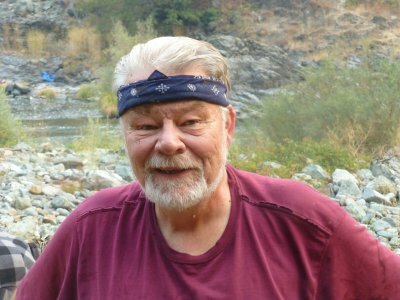 We take these projects seriously enough that some of our most dedicated helpers, like Rich Krimm, John Rose, Ray Derrick, Diane Helgesen and Derek Eimer devote several days in advance of a weekend project searching the river for just the right place. By this, I mean that there must be a high-grade gold deposit that is within reach of our methods of hand-mining. We need to be able to set up recovery systems in a location where natural contours on the bank will direct the dirty water from our high-bankers away from the river. There needs to be good enough access that we can get people safely down to the river, and sometimes across the river. Since we now have access to around 100 miles of mining property in the vicinity of Happy Camp, there are plenty of places to pick and choose from. Early this past season, we discovered just the right place around 9 miles downstream of Happy Camp. The site is located on the far side of the river on one of our newer mining properties, K-23AA. 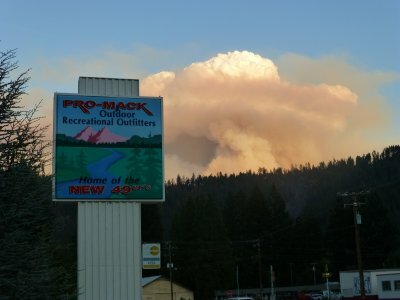 There is plenty of parking and overnight camping there in a large pull-off along Highway 96. Since it was going to be necessary to ferry participants across the river, we launched one of our large, commercial Colorado River rafts and powered it back and forth across the river with a small outboard engine. The interesting thing about these weekend projects is that they generate a lot of new ideas and innovation. There is always someone coming up with a new way of doing things. 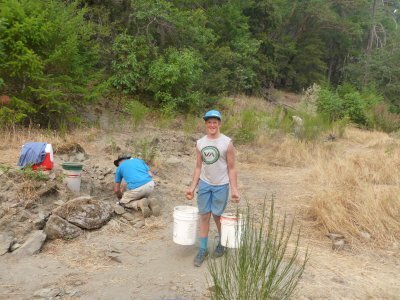 Our project helpers do a lot of prospecting on their own; so they are always coming up with a more efficient method of recovering gold. And, step-by-step, that’s how we developed this entirely new method of surface mining (high-banking) this past season. We call it “gravity mining.” This is a new method in the modern age. My guess is that the old-timers probably had this method of mining worked out at the turn of the century. The video and images in this story are from our final weekend event of last season. There were 53 enthusiastic participants, including our normal helpers, along with longtime members, Diane Phillips, Jim Yerby, Bob Sonnenburg and Gary & Sheri Standefer. Both Jim and Bob have been big supporters of our program for many years. Gary and I have a long history dating back to our time together in the Navy SEALs. We had already worked out the gravity mining method on the previous project, so setting up the project was pretty routine. Rich Krimm and John Rose always supervise the excavation activities on these projects. We had already devoted enough time in this gold deposit to know where the line of pay-dirt was located and what the pay-dirt looks like. It is an orange-colored compacted gravel on top of decomposed bedrock. Derek, Ray and both Diane’s, for the most part, manage the gold recovery systems. Gary & Sheri jumped into the excavation process. It actually takes some practice and experience to keep a steady flow of material moving through a syphon nozzle. My main job is to capture the project on camera. 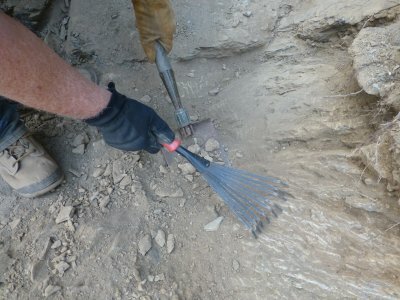 But I do like to take a hand in the excavation activity. I was able to get some work in on this project. One exciting thing about this method is that we can use extended lengths of hose or PVC plastic pipe and a series of booster pumps to process rich ancient channel deposits that exist further away from the active river, and even some distance up the hillsides. I have already seen one member using a second pump in line to boost the water further away from the river. Inline booster pumps are what firefighters use to direct pressurized water great distances away from the source, maybe even miles away! I stayed until dark and then swam the river! Throughout the day, our more experienced guys operated the syphon nozzles while most others were digging pay-dirt, screening it into buckets and pouring the pay-dirt into the water-filled excavations. 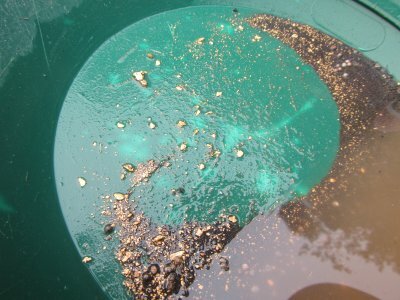 Of course, the more pay-dirt we process, the more gold we will recover. The beauty of this gravity mining is that we don’t have to devote time and effort packing pay-dirt very far. Good gold in the pay-dirt! Looks like you are digging a cave! That's a great crevicing tool! 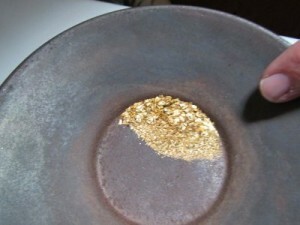 Just a little while later, I noticed a man & woman showing off some gold in a pan. I cannot tell you how important it is to pay attention to this sort of thing! Especially to me, because I am always looking for the next and better place to put on these weekend projects. I refer to this as staying on the right wavelength. When people are showing gold around, they get my full attention! 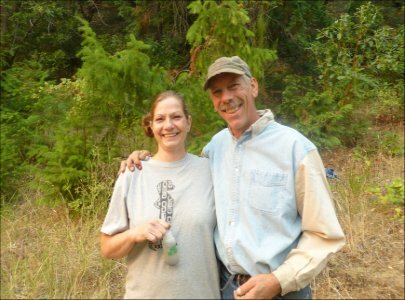 This couple turned out to be New 49’er members, David MacKenzie and Alice Leverenz. Showing off the gold from a single bucket of pay-dirt this couple recovered from an exciting new gold deposit they just located downstream. When I first saw David and Alice showing off their gold, I figured they recovered a good sample from the area where we were actively mining. But it turned out they were showing off the gold they had recovered out of a single bucket of streambed material a few days before in a completely different area some distance downriver. It was quite a good showing! They also had some very nice nuggets from digging down there in another place closer to the river. A whole new discovery just down around the corner! We are living off the gold we get! This is typically the way new discoveries are made along our extensive properties in The New 49’ers. Some member makes a good discovery and then shows it around. Other members migrate to the new discovery. Sometimes we have full-on gold rushes! There are rules in place which allow members to claim areas where they want to work. First come, first served. It’s a good system to allow members to spread the wealth around without worry over losing their own part of it. The place where David and Alice made their discovery is along an extensive exposure of surface streambed further downstream on K-23AA – which is quite a long claim. They were inviting and encouraging other members to join them down there in their good fortune. This is very common in The New 49’ers where we have plenty of room for everyone. Rich, John, Diane and I took them up on their offer a few days later, using my jet boat to gain access to the new discoveries. It’s all very exciting. I captured more images and video, and we are considering how we might move the weekend projects down that way this next season. Watch for more about this in a coming newsletter. Normally, the heat kills us off by mid-day during our projects in August. 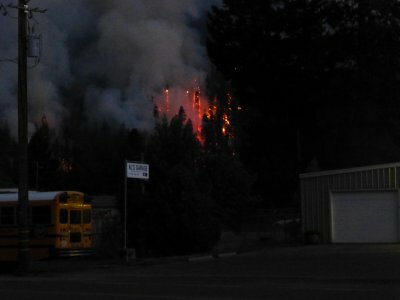 But the wild fires near Happy Camp were creating a light smoke haze in the air that was filtering the hot sun. I’m certain the whole group was willing to go all day if we wanted to, some of them even until after dark! But our project helpers already knew we had recovered enough gold by around noon. So we broke down the gear, filled in all our excavations and ferried nearly everyone back across the river. Once again, I believe the night-miner remained behind. Several hours later, after processing what we recovered back in Happy Camp, we split off 11.2 pennyweights of beautiful gold amongst 51 people. That’s a bit more than half an ounce. I believe it was a seasonal record. There were a bunch of small nuggets, two that weighed 7 grains! I was pleased to see so many happy faces. This is the part I like the most! I want to express a big thank you to all of our experienced volunteer helpers on these projects. You guys play a big part in making our organization great! Rinehart Decision will now go to California Supreme Court! We recently announced that the California Third Appellate Court refused the State’s request to reconsider their landmark Decision which confirmed the rights of prospectors to be free of unreasonable regulation when mining on the public lands. The Third Appellate also consented to our requests to publish their Decision so we could rely upon it in other ongoing and future litigation. In my own opinion, the published Rinehart Decision is the most important legal development in support of mining in America during the modern age. It is the turning point which should be the foundation of future mining in America. Since being denied by the Third Appellate for reconsideration, the State of California has submitted a Petition to the California Supreme Court to review the Rinehart Decision. They have also asked to have the Rinehart Decision be de-published. You guys can make your own evaluations, but I am seeing some deliberate misrepresentation in the State’s brief. They make it sound as though, once the outstanding issues are mitigated, we will be allowed to continue suction dredging — when the nature of the issues they have identified are such that they can never be resolved. Not to mention that the State’s moratorium on suction dredging is permanent! Here is James Buchal’s spot on answer to the State’s Petition for Review. Keep in mind that these briefs are not actually the review. They are arguments about why the California Supreme Court should, or should not, review the Third Appellates’ Decision on Rinehart. Just so you know, the California Supreme Court only takes up 5% of the Petitions it receives. Now, here is the State’s request to have the Rinehart Decision de-published. I suggest you read this brief if you can find the time. It will provide you with a perception of how desperate the State is to hold onto its totalitarian control and prevention of mining in California. In addition to relying upon extensive hearsay from an unnamed retired mineral examiner who was not present in any of the earlier Rinehart proceedings, the State, more or less, mirrors the views that I expressed in last month’s newsletter that the published Rinehart Decision will prevent them from imposing any unreasonable restrictions upon miners. Heaven forbid! Never mind that the U.S. Supreme Court has already made this determination. Here is James Buchal’s brief which argues against de-publication. Read it and feel proud. 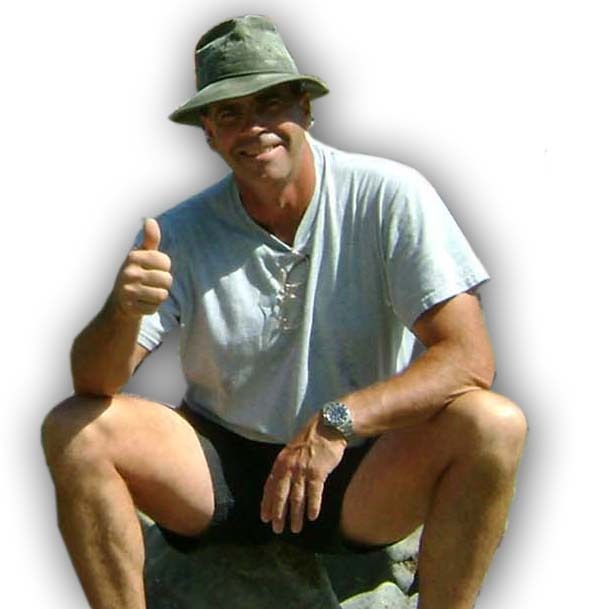 James Buchal is now basically representing most of the mining community, in multiple states. Because so many different individuals and mining associations are sending him money on behalf of Brandon Rinehart, and on other legal matters, it is inaccurate to call him only The New 49’er attorney, anymore — even though he does also represent us. The New 49’ers Legal Fund has committed to, and is actively, picking up the cost of any financial shortfalls in all or most of the mining cases that James is representing. The industry is very lucky to have James. Just as one example, He Skyped me from his office at 8 PM to discuss some technical matters several Saturday nights ago. He was working on his opposition brief to the State’s Petition to the California State Supreme Court. He was also in his office on Sunday evening, sending out update information to the industry on the correct address where we should be sending our letters opposing de-publication. James sent me his final Opposition brief to the State’s Petition for de-publication on Thanksgiving Day. I venture to say that none of the other attorneys in all the litigation we are involved with are as committed as the champion who is working on our behalf. I remember a time, and it was not that long ago, that our industry could not come up with the money to hire any lawyer. Now we have one of the best freedom fighters in the country on our side! We also have an army of fellow supporters working for our side! We only had 10 days from when the State’s request to de-publish was filed to deliver our own letters of opposition to the California Supreme Court. That was very little time to make something happen! 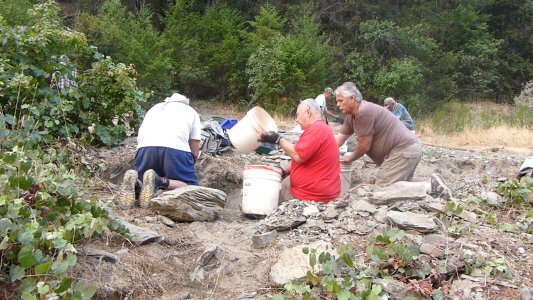 Our attorney believed it would be beneficial for the California Supreme Court to hear from an army of gold prospectors who have an interest in how this matter is going to be resolved in California. So we put out an emergency email to our entire Internet Action List asking for letters of opposition (to de-listing) be sent to the California Supreme Court by overnight express, along with copies to long list of the other attorneys involved with the case. “I called the CA Supreme Court clerk yesterday to see if they were going to docket my letter. 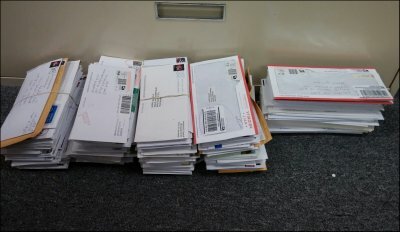 The kid was nice enough and said they had over 500 letters, too many to docket. But he assured me they were being forwarded “upstairs” to the Supreme Court. I reminded him that each of those 500 people paid $20 to overnight their letter, which did not seem to impress him. Then I informed him that the Appellate Court was docketing their service copies, which seemed to surprise him. I then asked him “HOW MANY LETTERS HAVE YOU RECEIVED IN SUPPORT OF DEPUBLICATION?” He replied that, as far as he knew, they had received NO letters in support of de-publication. ZERO. I was very nice the entire time and when he started with the “I only work here” routine, I thanked him and hung up. I got no sense that there was any ire toward miners; I think there are just too many letters and not enough time in the day to docket 500+ letters. Who knows, maybe it’s a record? We Have Purchased More New Mining Properties! On that note, we have recently purchased several more good properties on the Klamath River. Watch for more about this in coming newsletters. 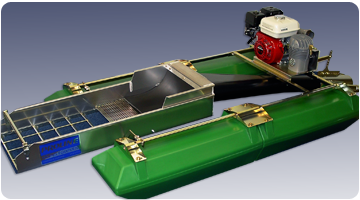 Proline Donated a 4-inch Dredge to Our Next Legal Fund Drawing! 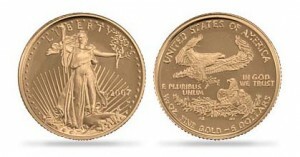 Twenty tenth-ounce American Gold Eagles. The New 49’ers Legal Fund drawing will take place just before the close of business at our headquarters in Happy Camp on Friday evening, 27 February 2015. You do not need to be a member of our organization to participate. You are welcome to be at the drawing, but you do not need to be present to win. Signing up also places you on our Political Action Team. Things happen so fast these days; it takes too long to organize political action through the U.S. mail. As an example, in a matter of hours, we generated a big portion of the recent letters to the California Supreme Court by contacting our supporters this way. All of these future battles will be organized over the Internet since it is so much faster. Please join us in the battle to maintain our remaining freedoms!